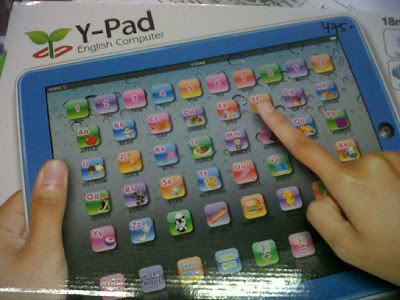 I remember seeing this obvious iPad rip-off in a store in the University of The Philippines once. It's called the Y-Pad and is an English Computer. Now, it's been a while since I've seen it and I did open the box to see what it was like. It was a light plastic iPad with lights on the side and really cheap buttons. It needed 4 AA batteries to run and make weird sounds. But hey, buy this for your kid so he can pretend he has an iPad when in reality, he looks like he has financial problems at home. Oh dear.